Since Mothers Day was on Tuesday, the Thai government decided to declare Monday a holiday as well. Therefore, my traditional two day weekend turned into a four day holiday! Initially, some fellow teachers that I work with suggested that we go to southern Thailand to enjoy the beach. Some suggestions that got thrown around were, Krabi, Ao Nang, Koh Lanta and Koh Phi Phi. Basically, anything that would include the sun and a beach! After the realization that the total cost of the trip would exceed our desired travel budget for the weekend, we deserted those plans and I was back to the drawing board. 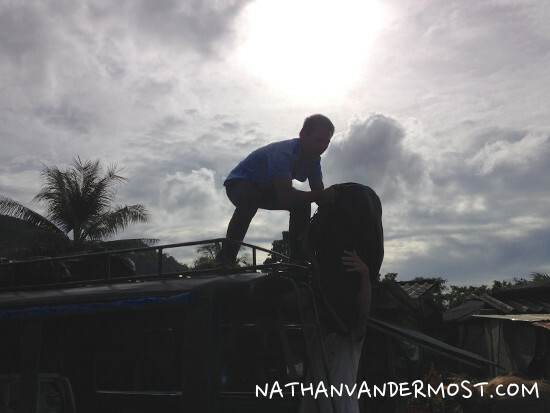 I quickly discovered that another teacher was planning a trip to Elephant Island, also known as, Koh Chang. We would soon discover that Elephant Island, Thailand is a teachers holiday paradise! When I first arrived to Thailand, I was able to explore many of the islands and get a could feel for what the different islands have to offer. Yet, I had not traveled to Koh Chang and was excited about the opportunity. After doing some more research, crunching some travel cost numbers, and finding round-trip flights from Chiang Mai to Bangkok for $100 USD or 3000 BHT, I was sold! Since my work colleague and friend Will had been to the island five times, I felt confident that we would have a great time with his local knowledge of the area. I enjoy the excitement of the unknown and traveling on the go but with a relatively short time window and having to cover a lot of ground it was comforting to go with someone who had made the journey many times before. We wanted to make the most of the weekend so we booked tickets departing Chang Mai at 5:30 PM on Friday evening. School ends at 3:30 PM and I still needed to rush home to pack and head over to the airport to make the 5:30 PM flight. It was a little tight but I was able to make it to the airport in time to check in for the flight. Will and I met at the airport, at the departure gate. There were a lot of people headed to Bangkok for the weekend since it was a big holiday for many Thai families. The flight was really smooth and only takes roughly an hour to get to Bangkok. We flew with Air Asia and arrived to Don Muang airport. After arriving to the airport we had to wait in a long line to get to a taxi to get into the city. The line to get a taxi took roughly 40 minutes. 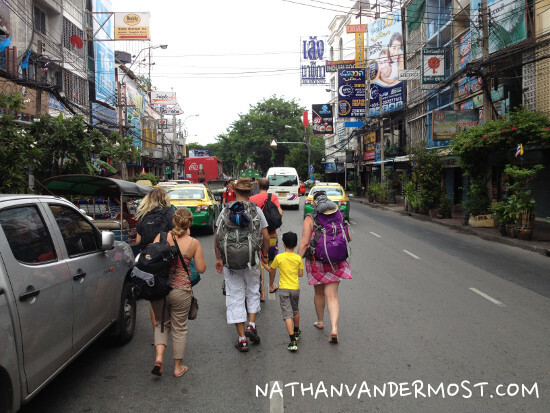 Once we got a taxi, we still had a 1.5 hour ride to get to Khoa San Road in Bangkok. There was a lot of traffic from people arriving to the airport headed into the city and you generally find heavy traffic in a city of over 7 million people…. Finally, after traveling for 4 hours we had made it to Khoa San Road and needed to find a place to stay for the night. Khoa San Road is a popular destination for travelers in Bangkok. It is made up of several streets and is always humming with people from all over the world. There are street vendors selling an assortment of trinkets and food vendors selling many traditional Thai dishes along with many restaurants. The street vendors stay out until roughly midnight and many food stalls stay open until the late hours of the morning. I was excited to be in a new place but did not feel especially chipper because I was feeling sick from some bad food that I ate the day prior. I had a feeling of malaise. My symptoms included a fever, feeling nauseous, and loss of appetite. Definitely, sub-optimal. 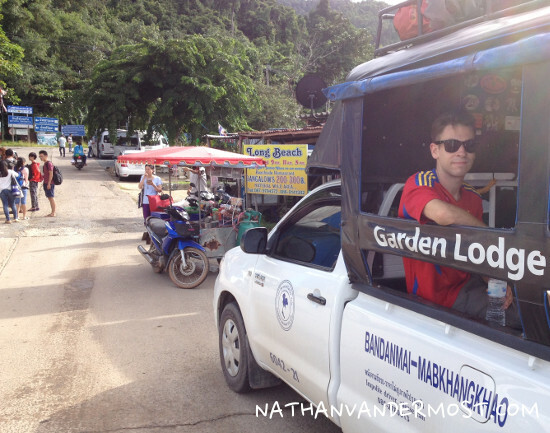 After first arriving to Khoa San Road and walking around to get oriented, we needed to find a bus to get down to Koh Chang. We found a travel agent that was able to book a bus. 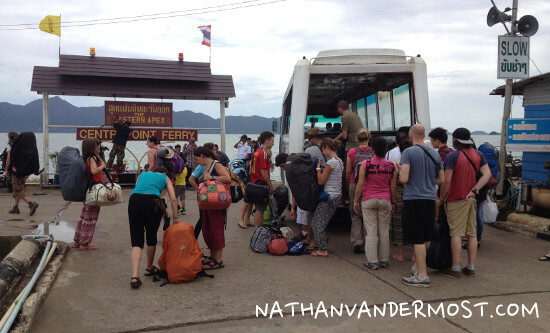 The total cost for a five-hour bus ride and a ferry ticket to get to the island was 700 BHT or $23 USD round-trip! whoa! After booking our ticket we needed to find a place to stay. The travel agent that booked our tickets suggested that we stay at a guesthouse that was right above the travel agency. The cost for the rooms were 600 BHT or $20 USD. We wanted to see if we could get anything cheaper and decided to keep looking. During this time, I still felt really bad and was in search of a cold coconut because I find that drinking coconut water is a great way to get rehydrated, in combination with water. Check out this article that shows the health benefits of coconut water. After dropping our bags, taking a shower, and changing we went out to find some food and explore more of Khoa San Road. Will also has a good friend that lives in Bangkok that was going to join us. Will and I found a restaurant and got some food. The restaurant was blaring with music and did not make for an optimal restaurant dining experience. I may even suggest bringing earplugs. 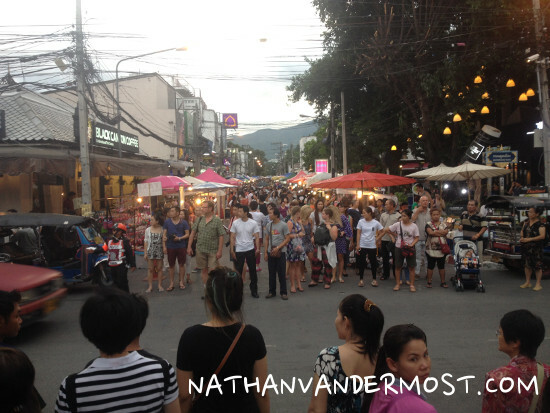 Most of the restaurants have loud music and that is just part of the Khao San Road ambiance. The rest of the evening was alright, it would have been better if I had been feeling better. It included socializing, talking with people from all over the world, getting a taste of the nightlife, and getting four hours of sleep… yay…. OK! My alarm on my phone goes off at 6:45am… “Get-up Nathan!” I think to myself. My phone blaring… err! err! err! I roll over and turn it off. I take a shower, organize my things, pack my bag and walk downstairs. Fortunately, there is a restaurant downstairs that serves breakfast. Score! “I need coffee…” I take a seat and get an omelet, toast, coffee and “nam som” also known as orange juice. Will came downstairs just as I was finishing breakfast. Instead of a bus, it was a guy on a motorbike whom instructed us to follow him several blocks to the bus which was parked on some random road, about a five-minute walk from Khao San Road. We made it to the bus and loaded up our bags along with many other travelers. The bus was a modern double decker coach bus. Will and I scored seats on the top level with a superb view of our surroundings. 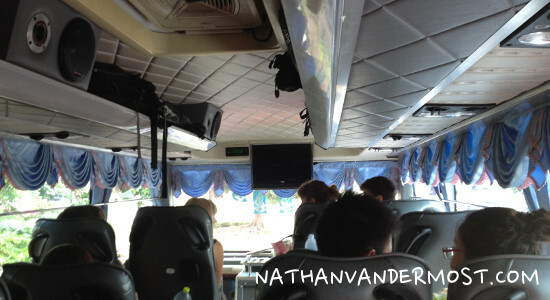 The bus ride was roughly five-hours and has one 30 minute pit-stop at a local Thai restaurant and snack bar. 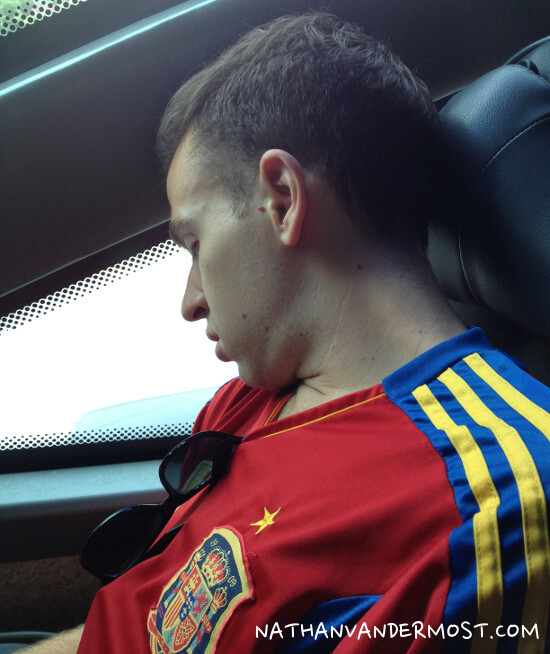 Will and I were able to get some napping on the bus which was much needed. 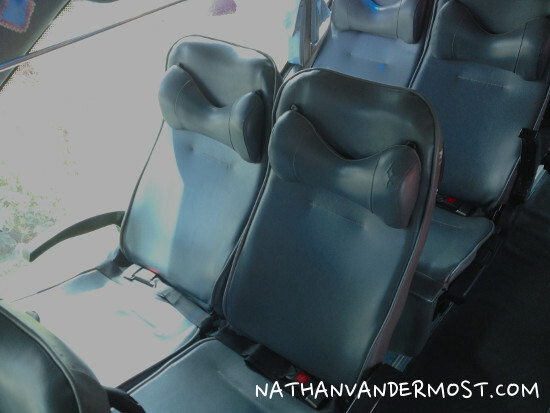 The seats on the bus fully recline and were very comfortable. At last, we made it to our final stop. We transferred to an open air bus that drove us a quarter mile down a pier to the ferry. When I departed the shuttle bus I looked up and saw the ferry. 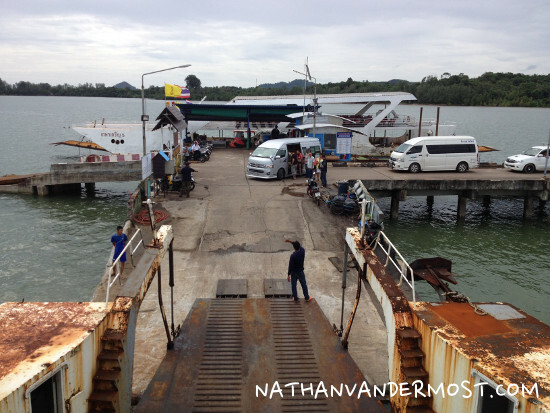 I thought to myself, “That is taking us across the water to Koh Chang. 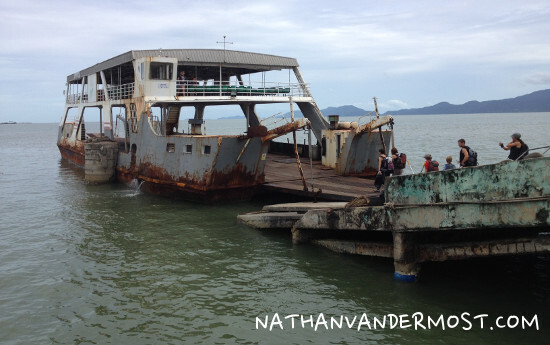 It might be safer to swim.” The ferry was in need of some serious TLC (tender loving care). The ferry had peeling paint and a lot of rust from the corrosion of the salty ocean. But it floated! Everyone from the bus boarded the ferry and we were off! The ferry ride was roughly 45 minutes and very beautiful. The weather was slightly overcast with a light wind. Once the island of Koh Chang was in view, I immediately noticed how lush and green the island was. This was a distinct difference that I noticed compared to the other Thai islands that I have been too. Once we departed the ferry, there was an arsenal of taxis to choose from. I have learned that it is best to share with more people to get the price down. The cost was 100 BHT or $3 USD for the 30 minute taxi ride to White Sands Beach. At last! We made it to White Sands beach by 4:30 pm, on Saturday, 24 hours after leaving Chiang Mai the previous day. We were ready and excited for the adventures that awaited on Elephant Island! 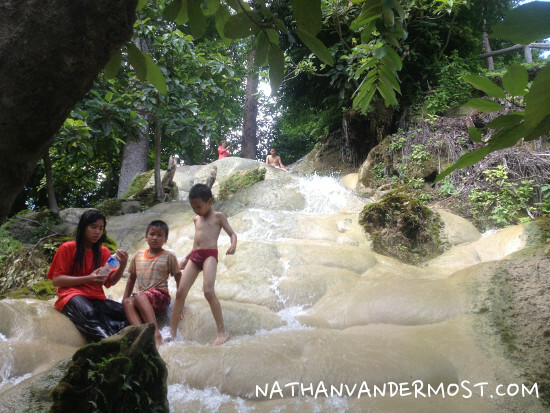 next post: Elephant Island: Waterfalls, Beaches, and Seafood, Oh My!